Onaga was platted in 1877 by the Kansas Central Railroad president, Paul E. Havens, and is located on the west slope of the Vermillion River in northeastern Kansas. Our beautiful small city is nestled in a little green valley on a series of hills rising to the north of a small stream. Picturesque main street runs from the winding railroad northward eight blocks on a gradual rise of one of these hills. The name of the city is derived from that of an Indian Chief called Onaje. This chief and his tribe formerly roamed over the Potawatomi Indian Reservation until they moved to Arizona where another town was named for him. The stability of the city stems from its diverse heritage originating from German settlers in the Mill Creek and Hise Creek Territory, French and Swiss in French Creek, the Irish in Coal Creek, and Pennsylvania Dutch in the Vermillion Valley. 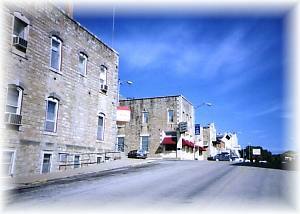 Today, many of the original limestone buildings remain along main street adding to its appeal. We have local access to a wide variety of retail and service businesses including a modern hospital, medical clinic, and a new assisted living facility, along with a nursing home, a bank, grocery store, hardware, restaurants, and a fantastic new nine hole golf course just to name a few. We are home to USD 322, a school system that cares about the needs of our children. The Historical Society Museum invites you to learn about our heritage and enjoy our warm hospitality. Potawatomie County has 1,707 acres of walk-in hunting. Located on the grounds of the Onaga Historical Society Museum is a cabin that was "uncovered" when an old house on the Kirke Grutzmacher farm was torn down. According to L.B. "Barney"
The lots for the Catholic Church were purchased on November 22, 1881. The original frame building was used as a place of worship until 1948 when the present stone church was completed. The 400 pound bell and the crucifix were saved from the old church.